This is our ELITE acoustic string set. 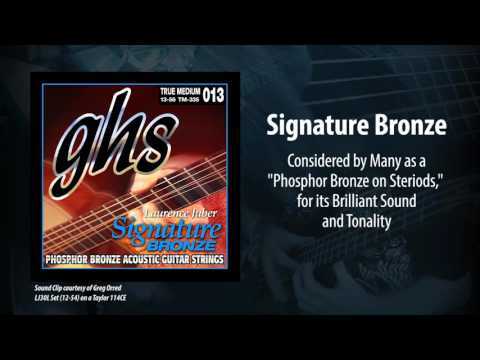 Referred to by many as "Phosphor Bronze on Steroids," this is an excellent in-between string for those that want a brighter phosphor sound but think the Bright Bronze™ is too much. GHS Signature Bronze strings feature a cryogenically treated copper, tin, and phosphor alloy wound over a hex, bronze-plated core. The plain singles are also bronze plated. The result is an even, long-lasting, rich, bright tone.